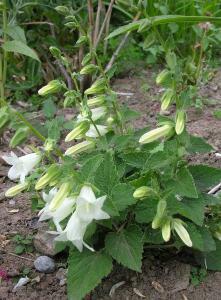 Campanula ochroleuca commonly known as the Bell Flower. It is a slow spreading clump forming perennial. It has grey green leaves that are heart shaped and hairy with arching stems with racemes of creamy white bell shaped flowers during the summer. Grow in a 'well drained' soil in full sun or partial shade. Hardy and grows to a height of 0.25m and a spread of 0.4m.